Banyumulek is a picturesque village located in the Kediri district, West Lombok regency that attracts countless tourists both from Indonesia and from all over the world. The Sasak people have been living there for ages, and pottery is what they know and love. Thanks to the ever-increasing demand of jugs, bottles, and other craft items, the village is getting bigger and better. Since the 90s, Banyumulek has been a very important part of the island’s economics, with more than eighty percent of the citizens working day and night in the pottery workshops. Now, you might think that I’m exaggerating a bit when I’m describing the people and the work that they do, but you’ll realize that it’s all true as soon as you enter the village. The beautiful green gate that welcomes the visitors says ‘Banyumulek, Pottery Centre’. Yep, it’s very similar to the tiny American towns that are completely focused on one thing, be it mining, farming, or, say, fishing. Even the local schools, the kindergartens, and the government buildings serve as a constant reminder that Banyumulek – Best Pottery Village, Lombok is not just a statement, but the truth. And that’s the beauty of it, as you’ll get to see for yourself once you step foot into this village. If you’re a fan of the hand-made stuff, the galleries in Banyumulek will, without a doubt, take your breath away. They can be found in pretty much every single corner, and there’s plenty to see there. All you have to do is clear out your calendar and take some time to admire the local talent. The range and the diversity of the pottery products are truly impressive, and the collection comes in different shapes, sizes, color, and everything else in between. You’ll find vases, jars, pots – you name it. According to the people of Lombok, before tourism became a “thing” on the island, nobody really cared about the decorative side of things. I mean, they were focused on making things that would be useful in the day-to-day lives of the regular men and women. However, after the self-proclaimed “Best Pottery Village” turned into a popular tourist spot, they started to make all kinds of souvenirs for the foreigners. So, if you’ve been looking for some wonderful decorations for the house, the garden, and/or great gifts for your friends/loved ones, Banyumulek – Best Pottery Village will be just the perfect place to find all that. By the way, the art of making pottery is something that the locals take very seriously and pass the knowledge down from the elders to the youngsters. As the locals like to say, you won’t ever be the same once you enter this village. It’s one of those unique places that have their own aura, their own “vibe”. Pottery is what these people know and care about, and there’s something truly humbling about that. Plus, as I mentioned above, Banyumulek is a great place to visit because of the rich historical and cultural heritage. I can say with absolute certainty that one can get lost among all the galleries and products available. It would be a good idea to at least get a picture in your head of what you’re looking for in Banyumulek, Lombok. Have you ever heard about the so-called Thief Jugs? They’re the pride and joy of the local masters and you should definitely check them out. Known as Kendil Maling, they have a unique design with a hole at the very bottom, and it’s used to fill up the jug. You’ll have to take the “thief’s way” and fill it up from the other side – that’s where the name comes from. Alright, now let’s talk about the fun part: even if you put it back like a normal jug, the water won’t come out of it. Sounds like magic, right? Well, that’s what Banyumulek – Best Pottery Village, Lombok is famous for! It all has to do with the clever design, though J. Without a doubt, a jug like that will serve as an amazing present and will always remind you of the good days spent in Indonesia. It’s safe to say that the products of this village have reached an international level because of the high quality and quite affordable price-tags. If you and your friends are up for it, the masters will teach you a trick or two and help you master the art of pottery. The tools are very simple and it won’t take much effort to learn the basics. 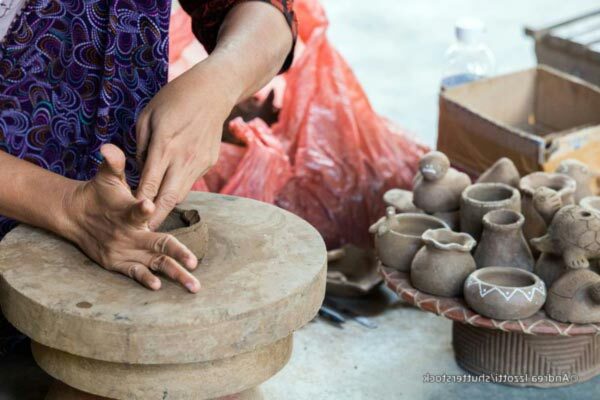 Don’t rush it and have some fun at Banyumulek – Best Pottery Village, Lombok! The place is surrounded with water, clay, and different materials that make pottery possible. The dye materials found in the village allow the masters to lower the prices and be competitive on the market. At the same time, some of the more “trendy” craftsmen prefer to use artificial coloring materials. Currently, New Zealand and the entire European continent are the biggest clients of Banyumulek. Depending on the complexity of the work, the size, and the texture, the price-tag ranges from 15K to 500K Indonesian Rupees. In dollars, that would be 1-36 USD, which is still very cheap. Cool fact: the masters never use any measurement tools to measure the diameter, which means every single jug is unique and they put their hearts into it! When you see the craftsmen create beautiful things using simple tools and clay, it gives you just the right motivation to do something great in your own line of work. So, as we just established in this article, Banyumulek is a colorful village that’s located on the south side of Mataram. But how do you get there to enjoy the pottery products and have an awesome experience with the fam? To get to the village, I’d highly recommend taking the Gerung-Lembar route – 6.5 kilometers south of Cakranegara. Take a look at it on Google Map below if you need a more detailed description. Your path begins at the Cakra Market. If you’re driving a rental car and/or bike, you’ll have to make a hard right at the crossroads of the woodcarving village (it will be hard to miss it) and drive straight for approximately two more kilometers. That’s when you’ll finally get to Banyumulek – Best Pottery Village, Lombok. Now, the important thing to understand here is that the entire place is a landmark. Every tiny house in the village deserves your attention. The natives will have pottery for sale on every corner of Banyumulek and will be glad to let you watch them work. Yes, the locals are very friendly and will happily show you around. Rismunika Astuti is the biggest and most famous gallery; so, check it out first for that full-on experience. It’s +/- 1 kilometer away from the center of the settlement. The good news is that this place has the most extensive collection of pottery products and numerous different designs that will bring a smile to your face. There’s always a resident potter at work, which means you’ll have the opportunity to learn something valuable from the master. Finally, the majority of the staff speaks English, especially the younger folks. Generally, the population of Lombok can’t even say “Hi” in English, but the modern-day generation certainly does know its way around the language. I personally bought quite a few items ranging from the more classic designs to modern-day jugs and pots. Given the fact that the prices in Banyumulek, Lombok are more than fair (especially if you’re from the US, the EU, or the majority of the Asian countries), you can buy a whole bunch of stuff here. You can even bargain a bit with the masters if need be. One final thing: these folks handled freighting beautifully and I received every single item in about 1,5 months. If you can’t wait for that long, be “pickier” and purchase only the stuff that you really need. When you’re traveling with friends/family members, carrying all that weight shouldn’t be a problem for y’all. Ok, that’s it for today – keep up with us and take care of yourself on these trips! Shipping is good. I received everything just when I expected to. The prices are affordable like you mentioned, but I still managed to "beat" a discount out of a local master. Happy with my new pottery items :). The artircle is great, but you have to experience it all on your own. Otherwise, you won't get even the half of it. The locals truly are very friendly and helpful. Had a wonderful time there! Not the most exciting trip in my opinion, but it certainly is great if crafting is your passion. Indonesia is a magical place; but, again, only when you know how to ride on the same wave as the locals do. Lombok is very fresh and life-defining. There's a wonderful atmosphere in the air that sets you in just the right mood. The village looks like a settlement from the fairytale movies, especially with all those jugs and cups lying around.